Anthony Howell’s home, left, during the August 2016 flood. IT WAS STILL dark at Anthony (Cornbread) Howell’s home in Albany, Louisiana, one rainy morning this past August when he was awakened by pounding on his front door. An anxious neighbor told him she had water coming into her house. 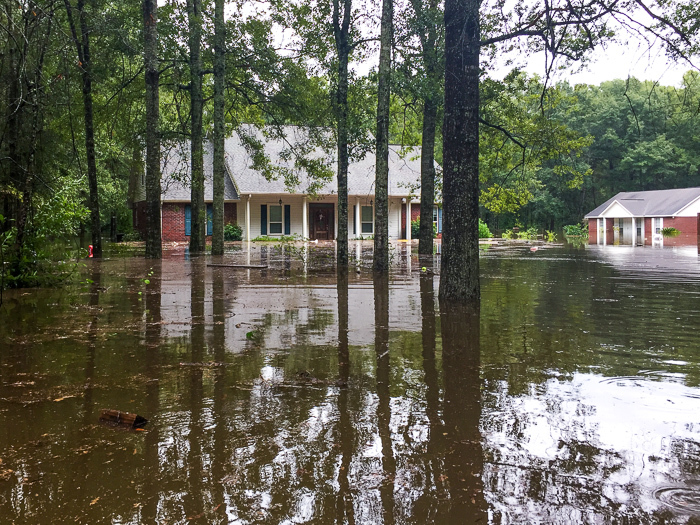 Historic rains had been drenching the state, and in Livingston Parish, where Howell lives, more than 31 inches fell in 15 hours. Within an hour of talking to his neighbor, Howell, the business manager for Local 37 (Slidell, Louisiana), saw water rise a foot inside his own home. It would reach 26 inches, “floating the beds” before it stopped. He told his wife and three teenage daughters to grab some clothes and any medicine they would need, and the family prepared to drive to higher ground. But first Howell waded into neck-deep water pushing a “flatboat” to help an elderly neighbor known as Miss Penny get to safety. “I was in survival mode,” Howell would later recall. “We just had to get out of there.” Howell and his family drove to nearby Ponchatoula and spent the next eight weeks living at his mother-in-law’s home. Escaping the flood was just the first phase of the crisis. Rebuilding their lives and property would take much longer. Although the water receded fairly quickly, a contractor told Howell it would take around $80,000 to fully restore his home. Unfortunately, the flood insurance policy Howell had purchased weeks before had not reached the 30-day threshold before it would kick in. The insurance would not be paying a dime. In the meantime, a check arrived from the Boilermakers’ disaster relief fund. The money was a shot in the arm for the family, who, with the help of friends, was doing as much of the restoration work as possible. It was also a boost to their morale. The fund has assisted many members who have been impacted by natural disasters, from a tornado in Indiana to wildfires and flooding in Alberta, to flooding in Texas and Louisiana, to Hurricane Sandy in the mid-Atlantic and Northeast. The Boilermakers International is working to develop a website to make it easier for members to donate to the fund. The website address will be published in a future issue of The Reporter.